The Mark Emory Graham Chapter of the Vergers’ Guild of the Episcopal Church met for their Summer Assembly on a bright shinny (and hot) day on June 13 just east of Atlanta. We were hosted by St. Simon’s Episcopal Church in Conyers. Thirty-one vergers, clergy, and guests participated in the gathering. Ten vergers joined the MEG Chapter for the first time when they paid annual dues. After a meet and greet session along with coffee and pastries, we gathered together for Eucharist. The Right Reverend Keith B. Whitmore, Assisting Bishop of Atlanta, was Celebrant and Preacher. Bishop Whitmore was assisted by The Rev. Jane Weston, Priest-in-Charge of St. Simon’s and The Rev. Zach Thompson, Rector of Our Saviour and Chaplin at Emory University. Bishop Whitmore addressed the vocational nature of the Episcopal Church. We are called by God via the Holy Spirit to be vergers. This is not a casual or occasional thing. Neither is our ministry, unlike ordained ministry, a narrow thing. He commented that ordination was itself a "focusing" act, while our ministry as vergers requires a broadening of emphasis. Leadership requires sacrifices. Recall Moses and the leading of the Israelites to the Promised Land? Moses never arrived. We give up our old way of participating in worship for a very different experience. The Bishop implored us to lead with Christ in our hearts and in our lives; don't just "lead the parade" on Sunday morning and call it done. The Bishop’s discussions were followed by a scrumptious lunch of BBQ chicken and pork and all the trimmings. Afterwards The Rev. Weston welcomed us to St Simon's with some personal remembrances of her positive experience with vergers. She ended her brief remarks with the rejoinder that "Priests need vergers - if you feel unappreciated, just don't show up some Sunday and see what happens!" The Cathedral Bookstore, thanks to Sue Davy, made available a wide selection of reference materials and books to aid vergers in their ministry. Sales were brisk; clearly our members like to continue learning to become better vergers. The Rev. Thompson began with the assumption that we Episcopalians are a Sacramental community of Christians, that vergers are a ministry called to lead Christians. We are to lead them to a particular place, at a particular time. If you are going to tell people "where to stand," you should know what you're talking about. Further, anything that removes the priority from the notion that we are a Liturgical Eucharistic group is harmful. This is the basis of a sacramental community of Christians! Thus, our challenge, if we are to be a certain type of people, doing a certain type of work (vergers), is to understand WHY we have "people stand over there." Without a clear understanding of Liturgical orthodoxy, we lack the ability to discern that which is harmful or that which distracts from the primacy of worship. Father Zach urged us to be folks who, by our VERY BEING, make God very apparent to others. Be clear about spiritual discipline, and model your Baptismal covenant. We need to spend time in contemplation, "Waste time in contemplation". Divine, Trinitarian love sustains us, so we must stay in touch with that love. Because of this contemplation, we are fit to “Go forth and serve others." The meeting was called to order by Chair Lorie Tola followed by an opening prayer, approval of the Winter Assembly Minutes and a report from the Treasurer, Karl Sachsenmaier. There is over $2000 in the treasury. A significant portion of this will be used to fund the Acolyte Festival next January. Those assembled elected Phillip Knight as Vice Chair and Mary Beth Westmoreland as Secretary. The proposed changes to the bylaws were approved unanimously. Chuck Dale, Communications, gave a brief presentation of our new Verger Web Site www.vergeratlanta.org. Chair Tola announced the 2016 Acolyte Festival cohosted by the MEG Chapter and the Commission on Liturgy will replace the Winter Assembly meeting. Chapter members were encouraged to sign up to be tellers at the 109th Annual Council of the Diocese of Atlanta at the Gwinnett Center in November. Scott Smith, President of the Vergers’ Guild of the Episcopal Church (VGEC), was introduced. He provided an overview of the activities of the National Guild emphasizing the reduced cost of the VGEC Training Manual, promoting the Guild Shop http://shop.vergers.org and encouraging everyone to register and attend the 27th Annual Conference of the VGEC in St. Louis October 1 – 4. Smith invited the MEG Chapter to Chapter to make a formal application to host the 29th Annual Conference of the VGEC in 2017. 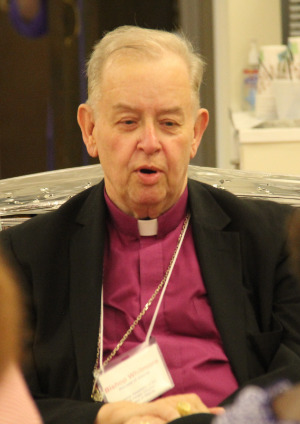 He advised that the Atlanta Chapter is the largest and the most active chapter in the Episcopal Church. The invitation was unanimously accepted by those in attendance. Vice Chair Knight closed the meeting with a prayer. The Bill Monk photo gallery of the Summer Assembly Meeting may be viewed by clicking here. All vergers in the Diocese of Atlanta are automatically members of the MEG Chapter and can attend and participate in meetings, take advantage of training, materials, fellowship, etc. Have a question? Would you like additional information?